Oh, dear. You know the leftists and the Islamists won’t like this one bit. But this could have been avoided if Israel had been properly respected as an independent nation in the first place. Israel had declared Jerusalem its capital city in 1950, but it has largely not been acknowledged in the international community because of the constant pandering to Palestinians repeated attempts to arrive at a Middle East Peace deal. It’s apparently offensive to allow the lone democracy in the region to choose its own capital because of the thousands of years of religious and historical significance to its people. President Trump has decided it’s time for Leadership from out in front on this issue. Donald Trump is likely to announce next week that the United States recognizes Jerusalem, not Tel Aviv, as Israel’s capital, a senior official has said – potentially causing chaos in the Middle East. Trump may make the declaration on Wednesday, the senior member of the administration told Reuters. Jerusalem is claimed by both the Jews and the Palestinians as the capital of their state, so the international community has been pretty cagey about choosing one side or the other for fear of escalation of violence. Jerusalem – which contains sites holy to the Muslim, Jewish and Christian faiths – is claimed as the capital of both the state of Israel and a proposed Palestinian state. The international community doesn’t recognize the Palestinian claim and does not recognize Israel’s claim to section sections of the city that it annexed from Palestine following the 1967 Middle East War. In recent years, our Presidents haven’t been much better as they’ve all been trying to broker a deal. But in 1995, a law was passed declaring that the US embassy be moved from Tel Aviv to Jerusalem. Every president since then has signed a waver every six months to put off that transfer, in the hope of not further widening the rifts that exist in the region. Instead, they have said, Jerusalem’s status must be decided only in negotiations. For me, the Jew that I am, Jerusalem is above politics. It is mentioned more than six hundred times in Scripture—and not a single time in the Koran. Its presence in Jewish history is overwhelming. There is no more moving prayer in Jewish history than the one expressing our yearning to return to Jerusalem. To many theologians, it IS Jewish history, to many poets, a source of inspiration. It belongs to the Jewish people and is much more than a city, it is what binds one Jew to another in a way that remains hard to explain. When a Jew visits Jerusalem for the first time, it is not the first time; it is a homecoming. The first song I heard was my mother’s lullaby about and for Jerusalem. Its sadness and its joy are part of our collective memory. Maybe pandering to the Arabs and denouncing the Israelis isn’t working. Perhaps we should try a new way and make it clear that we stand with Israel. Because it’s worth standing for. Sometimes, you just have to do the badass thing because it’s the right thing. Does your grandpa go off on paltry politicians, whether they be Democrats or Republicans? Does he get misty eyed when he talks about God and Country and America’s future? And have you ever heard him scream, ‘Awww … Hell no!’ when Rosie O’Donnell starts yapping on television? If you answered yes to one, or all of the above, then your gramps will love Doug Giles’ latest book, My Grandpa Is A Patriotic Badass. You’ll love My Grandpa Is A Patriotic Badass just as much as Grandpa will. Even Mark Twain wanted to drain the swamp! 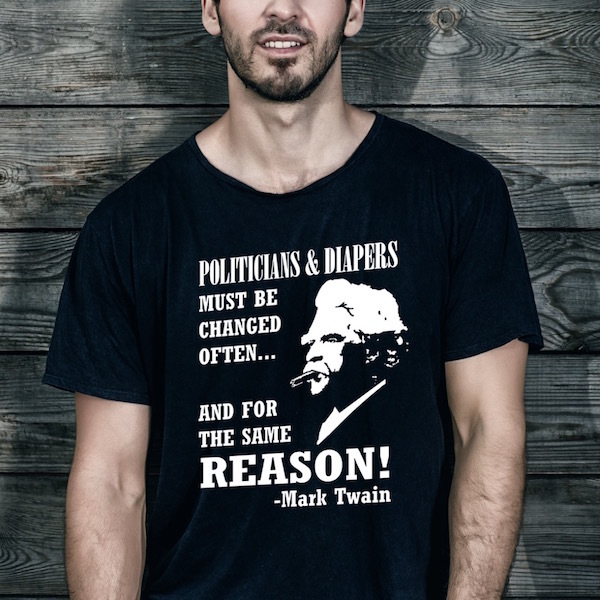 “Politicians are like diapers; they need to be changed often and for the same reason” – Mark Twain. Show your elected officials all the ‘love’ they deserve. Get yours now! CLASH POLL: Are We Headed For A 2nd Civil War?